This thread is intended for posting of Directions to, Descriptions of and Maps of all your favorite 4wheeling areas that you want to share with the public. That being said ONLY and I mean ONLY Posted, Legal, Public ORV use area maps are authorized to be posted on this thread. I really think this is avery good and useful thread to post for all to use. The first time I see a map of or directions to Make-out Point or the mud bog in Farmer Johnson's field the thread will be deleted and that will be that. Please donnot abuse this thread and feel free to post maps of any authorized 4x4 Parks in the CF PNW Area on this thread. Here we go. I figured I would start this out with a map of my favorite local 4wheeling spot. Anytime, Anybody ever wants to come check out and 4wheel Walker Valley just let me know and I will gladly guide you through the trails. Here is the link to the Walker Valley Map. I'm guessing the file was too big because I got an error when I tried to load the map. Last edited by BuckB91XJ; 07-19-2012 at 03:06 PM. Fixed my Walker Valley Map link. It actually works, now...LOL! But, you guys get the idea. Basically somebody wants to know How to get to Walker Valley and then wants to see a map of the trail system. He goes to the Trail Map Thread and clicks on the provided link. Badabing, there's a map of how to get to Walker Valley and a map of the trail system so he know's where he's going when he gets there. Last edited by BuckB91XJ; 07-19-2012 at 03:10 PM. Here is the most recent Elbe map. Last edited by mudderx; 08-22-2013 at 07:14 AM. Awesome, Wade!! Thanks for the contribution. Elbe, another of my favorite spots. Come on guys keep them coming!! 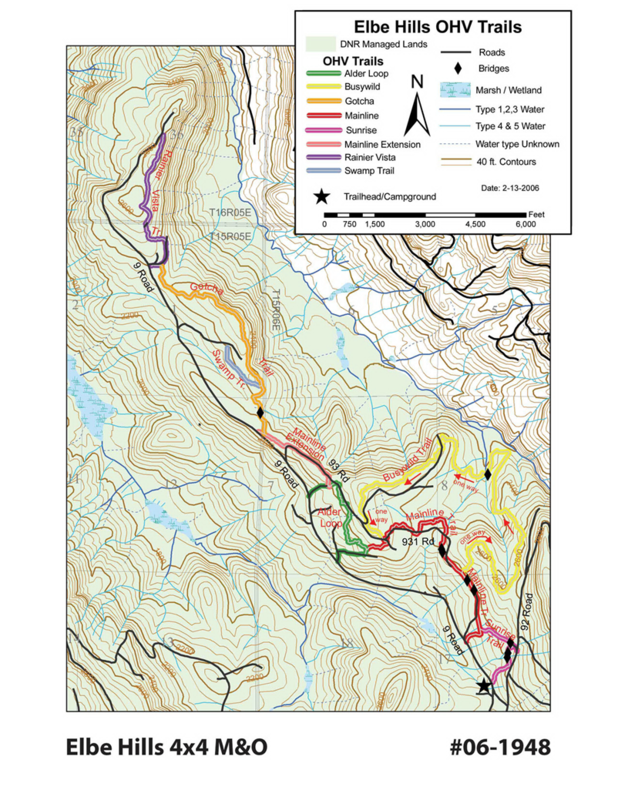 Here is a map of Tahuya State Forest ORV area courtesy of the DNR. Complete with directions to get there. This is the best and most recent map, I know of, that exists of Evans Creek. If one of you local boys has a better one post it please! Here is the Jeep club trail map for Tahuya. Not the best but it shows the actual trails. Last edited by mudderx; 07-19-2012 at 03:45 PM. Trail Maps made by guys who actually travel them on a weekly basis are much more accurate. I know the Quadrapaws are the local 4x4 club who long ago claimed and has taken care of Tahuya for years. Thanks, Wade!! after i figure out why my jeep isnt running i would love to go check out any spot anybody is willing to show me to or through. i heard this place has awesome trails and some good mudd holes. would love to go. question, do i have to have the orv tag on my jeep and if so where do i get it? You need a Discover Pass to operate a vehicle in the Tahuya state forest... For that matter any DNR land requires it. A Discover Pass can be obtained at Wal-Mart, Fred Myers, Sportco, Sportsmans warehouse, or any other retail chain that sells Fishing / Hunting license. And I believe your local DMV can also sell you one but I may be wrong on that. If you have any other questions please send me a message on cherokee forum and I'll be glad to help. Copper Creek Road aka NF-59? Good snow wheeling area in the winter but its just a forest service road that gets a buttload of snow. looks like DNR just released a new map for capital state forest..
and here's a pdf for it..